This product was manufactured in the United States under the strictest quality control standards with a purity level exceeding 98%, assayed via HLPC. It is furnished strictly for non-diagnostic, non-therapeutic in-vitro applications only. It is not intended for direct human and/or animal consumption and should only be handled by qualified professionals. IGF-1 LR3, also known as Long-Arginine-3-IGF-1, is an analogue of human IGF-1 that has been modified to include a 13 amino acid N-terminus extension and the substitution of Arginine for Glutamic Acid at position 3. 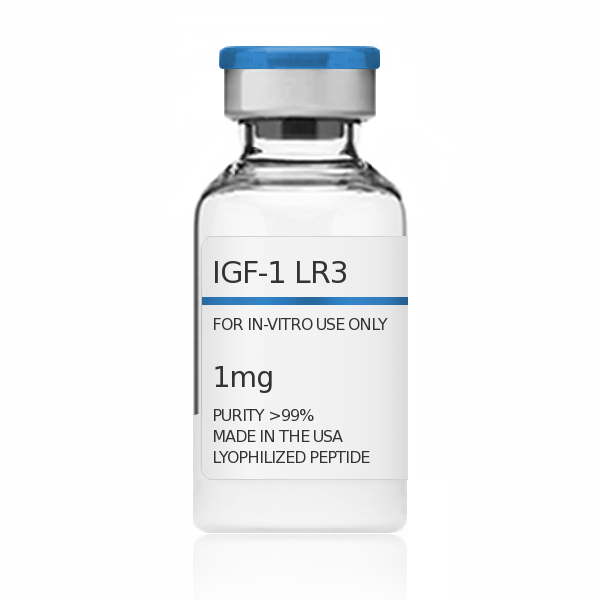 As a result of these modifications, IGF-1 LR3 is approximately three times more potent than IGF-1 and possesses an increased half-life due to lowered affinity for binding to the Insulin-Like Growth Factor-Binding Proteins (IGFBPs). IGF-1 LR3 retains the ability to bind agonistically to the IGF-1 receptor with improved metabolic stability, relative to IGF-1. The supplementation of mammalian cell cultures with Long R3 IGF-1 at a much lower concentration results in more highly elevated productivity than with standard concentrations of insulin and/or standard IGF-1. IGF-1 LR3 is more able to stimulate the type 1 IGF receptor and thus induce a higher level of activation of intracellular signaling, which is responsible for promoting cell proliferation and the inhibition of apoptosis. GHPeptides™ IGF-1 Long R3 has a purity level that exceeds 98.0% as determined by SDS-PAGE Analysis. This peptide was synthesized with no additives and is supplied as a white lyophilized (freeze-dried) powder. It is recommended to reconstitute the lyophilized IGF-1 Long R3 in sterile water, which can then be further diluted in other aqueous solutions. Lyophilized IGF-1 Long R3 although stable at room temperature for 3-4 weeks, should be stored desiccated below -18°C. Upon reconstitution, IGF-1 Long R3 should be stored at 4°C out of direct light for between 10-14 days and for future use below -18°C. Prevent repeated freeze-thaw cycles.